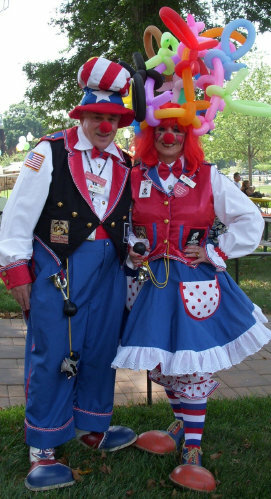 Clown Gary and Clown Judy in full costume! Gary overseeing the installation of his new transom. 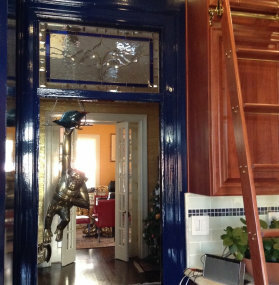 Gary overseeing the installation of my transom at the entrance to the new kitchen. Gary called me about building 2 transoms for his magnificent 1906 home in the Cleveland Park Historic District of Washington DC. Gary told me that he and his wife have lived in this home for 42 years and have done at least a dozen major renovation projects to this amazing 5000+ square foot home. 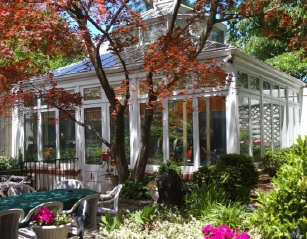 I thought one of the most interesting parts of his home was his free-standing Conservatory in his back yard (pictured on the left).... what an amazing structure! 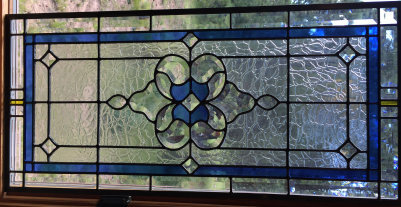 Gary sent pictures of some of the stained and beveled windows already in his home.... and I can truthfully say I was a little intimidated.... some really nice windows. 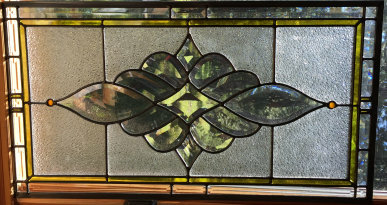 Transom created by Marty with a bevel cluster Gary commissioned from a Romanian glass-making firm. 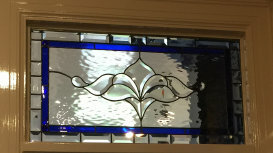 Gary sent pictures of his new stained glass after his project was completed. 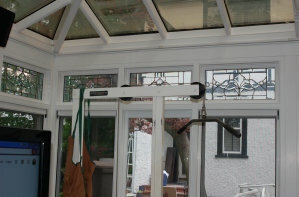 Below are some photos after installation. Gary was quite a character to work with! 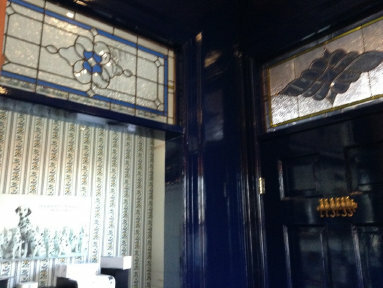 He knew exactly what he wanted and provided a wealth of background info and photos to help design his transoms. One of the disadvantages of working long distance on a project such as this is that I rarely get a chance to meet the people with whom I work. Gary and his wife Judy would be fun to meet in person. He is obviously a successful, self-made man. Interestingly enough, late in this project, I found out that Gary and his wife are volunteer clowns, working primarily for wounded warriors and their families at Walter Reed National Military Medical Center and various pediatric wards at local hospitals. Gary and his wife, Judy, have urged me to visit them in Washington, DC. 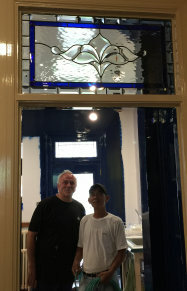 I hope to get a chance to work with them again on a glass project. 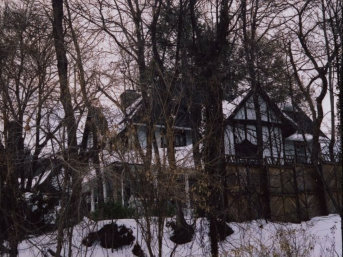 Gary's English Conservatory - currently used by Gary as a gym and wood-working shop. 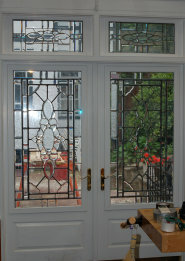 Gary wanted 4 new stained and beveled transom windows for his project. 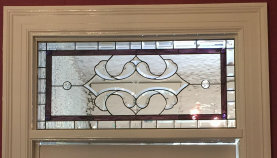 He commissioned me to create the entrance transom to the new kitchen that his dinner guests would see from the dining room (pictured above in my studio). 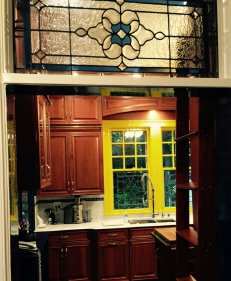 He also commissioned Marty Langion -- an accomplished artist from Telluride, Colorado -- to create two interior transoms within the new kitchen (pictured below). 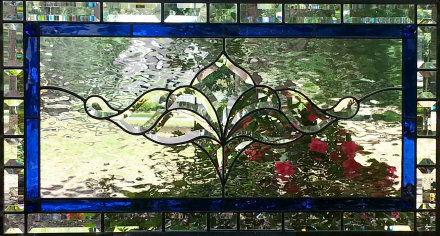 Gary chose the bevel sets for each transom and coordinated the work I did with Marty's work so that our transoms would work well together.